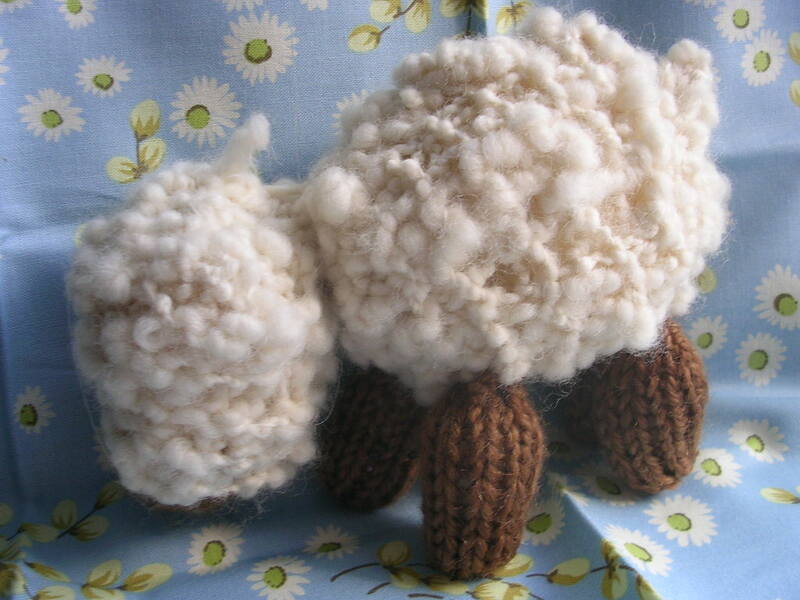 The class of 2007 and the handwork teacher at my son's school put together a kit and pattern for this lamb complete with slubby cream wool for the body and brown worsted for the nose and legs. Each part of the animal is made from a square knitted patch sewn together along two opposite sides and then drawn together at each end after stuffing. The nose is formed by knitting the last quarter of the head square in brown. The legs each have a marble stuffed down at the bottom to give the puppet weight. The head is not firmly sewn to the body so that the puppeteer can make the lamb nod and graze. Fishing line is tied to the head and hindquarters and to the ends of a short branch.